Ford Philippines is gearing up ahead of this year’s Manila International Auto Show (MIAS) with exclusive offers available only during the MIAS’s duration of April 5-8, 2018. Customers who will purchase an Everest, Ranger, or EcoSport are entitled to get free two-year service and 10 percent discount on accessories bundle. Customers who test drive and place a reservation will get additional free fuel voucher and exclusive Ford merchandise. 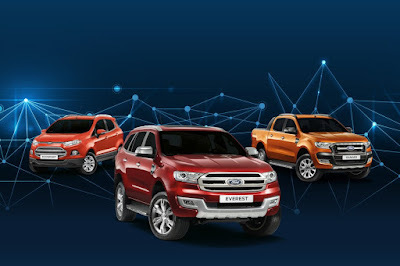 Ford, in partnership with EastWest Bank, will extend lower financing rates for customers buying the Everest, Ranger, or EcoSport during the show. Meanwhile, existing Ford owners can also visit the Ford booth at the MIAS grounds for free vehicle inspection that will cover visual and oil quality checks, tire inspection, detailed vehicle report card, midtronics battery testing, fluid levels checks, among others. Customers can also drop by the service booth to learn more about Ford’s cost of ownership, worry-free ownership, and extended warranty packages. The same exclusive privileges are also extended to customers who will test drive and reserve an Everest, Ranger, or EcoSport at Ford Pampanga, Ford Cebu, and Ford Davao from April 5-8, 2018.